December 24th 2014 is the deadline for comments or motions to intervene with FERC about the Sabal Trail pipeline. Here’s how to file a motion to intervene on docket CP15-17. And here once again is the deadline. 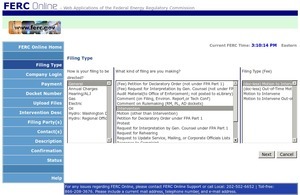 Informally I hear that FERC might accept such things later than the deadline, but that would be pretty much at their discretion, and I’ve seen nothing in writing. So if you want your views and information to be heard, not only by FERC and Sabal Trail, but also by everybody who is watching docket CP15-17, file before the deadline. FERC set a deadline of only three weeks for motions to intervene, and apparently also for commenting, on Sabal Trail’s formal permit filing in Docket CP15-17. It’s time for opponent organizations and individuals to get their interventions and comments in, including requesting an extension of this absurbly short comment period. Elected officials can help, from local county and city governments to state legislatures and agencies, to Congress members and federal agencies. If you ever want to appeal or be a party to any legal proceedings, you must file to intervene. Now’s the time! Update 2014-12-17: How to file a motion to intervene. Update 2014-12-15: A couple of examples to illustrate that a motion to intervene can be very simple, with nothing more than organization name, contact information, docket number, and a paragraph of Basis of Information: Florida Gas Transmission and Florida Natural Gas. If fossil fuel companies can do it, pipeline opponents can do it. You can also post a selfie with your intervention. Give Sabal Trail a Christmas present to remember! Sabal Trail had a full year to develop the hundreds of pages of material it filed November 21st but FERC’s December 3rd notice gave only three weeks for opponents to digest all that mass of information and produce coherent comments. And to make it even harder, major parts of Sabal Trail’s filing are marked “CONTAINS PRIVILEGED INFORMATION — DO NOT RELEASE”. That’s right, Sabal Trail filed at Thanksgiving, and FERC expects all comments or motions to intervene by Christmas. Happy Holidays!